The 2 stagemaster HH720 is a cost effective easy to use module for testing two stage injectors. The HH720 is used in conjunction with either the Testmaster 2 HH700 or Testmaster 3 HH701 injector testers. 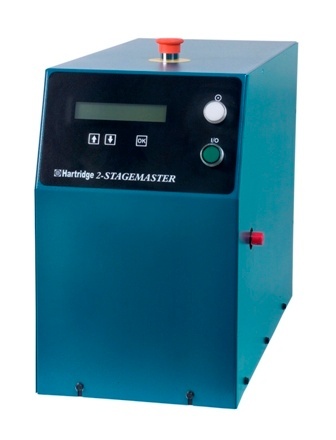 The 2 Stagemaster HH720 features an LCD display and simple automatic controls to determine the second stage opening pressure (NOP2). The first opening pressure (NOP1), spray pattern, back leakage, front leakage are checked using the Testmaster 2 HH700 or Testmaster 3 HH701. Nozzle Opening Pressure (NOP2) cannot be detected by measuring only pressure or only flow. Similarly injected delivery alone does not give an indication of Nozzle Opening Pressure (NOP2). Measures flow over a range of pressures to establish a true Nozzle Opening Pressure (NOP2) value. Measures injected flow at the first stage and second stage needle lift to confirm the actual change in nozzle flow rate. Integrates with Testmaster 2 HH700 and Testmaster 3 HH701. The Nozzle Opening Pressure (NOP2) pressure is displayed on the LCD screen. A selection of pre programmed test plans to test popular injector applications. A guided facility for the operator to program further test plans. Efficient method of establishing Nozzle Opening Pressure (NOP2) without having to remove the injector from the host Testmaster and with no time consuming test bench set up. Enables the flow and second stage opening pressure of all two stage injectors to be verified without having to dismantle the injector or isolate the first stage lift. Creates opportunities for servicing two stage injectors in diesel workshops. Can be used as a comparator when injector test data is not available.